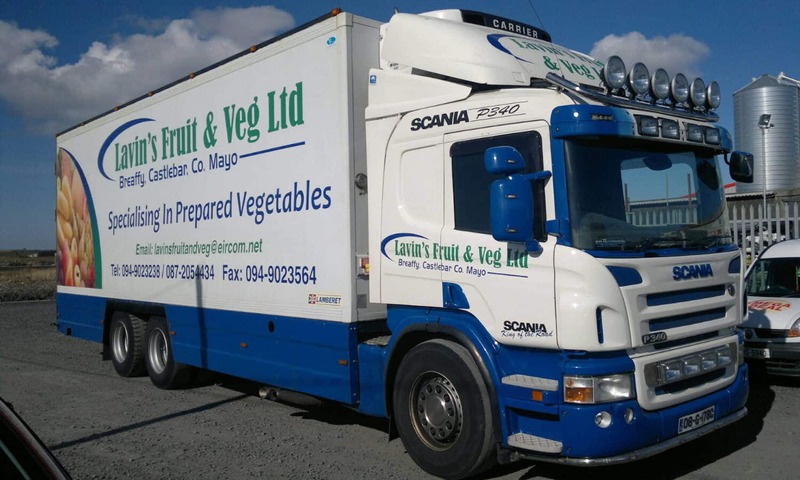 Lavins Fruit and Veg ltd is a family run business established in 1986 by Mary & Eamon Lavin. They quickly gained a reputation for reliable, friendly and efficient services, subsequently they were awarded the contract to supply the HSE hospitals in the Mayo area in 1987, and still supply those hospitals to this very day along with Galway and Roscommon included, this is something we take great pride in. Eamon looked for ways he could improve the quality and level of service he provided to his customers and in 1988 he peeled his first potato, to later on become specialists in prepared vegetables. The business grew from strength to strength and in 2003 Mary and Eamon incorporated to become Lavins fruit and Veg Ltd. In 2009 we expanded the premises doubling our refrigeration capacity and also increasing the size of our preparation area. We currently employ 46 people and have a fleet of two Lorries and seven vans. We supply a wide spectrum of businesses such as retail shops, factories, hotels, nursing homes, restaurants and schools but to name a few. We supply the Mayo, Galway and Roscommon area. At Lavins Fruit and Veg Ltd we take great pride that we are a family run business and we strive to ensure that our customers enjoy the benefit of this, receiving high quality wholesome fresh fruit and vegetables with a flexible, professional, friendly service.